Be the first to share your favorite memory, photo or story of Maurilio. This memorial page is dedicated for family, friends and future generations to celebrate the life of their loved one. Maurilio Soto (Papi Chiquito) 78, fallecio el 19 de Enero del 2019. Nacido el 22 de Septiembre del año 1940 en Guerrero, Mexico. Casado con su esposa Francisca Romero, tuvieron 4 hijos; Jose, Dalia, Veronica, y Rodolfo (quien fallecio a pequeña edad). Paso momentos muy alegres con sus gran familia de 1 nuera y 2 yernos: Violeta, Jose Alberto, Damian; y 8 nietos: Rodolfo, Iris, Monica, Mayo, Ivan, Josemir, Bianca y Damian Jr.
El vino a las Estados Unidos hace 38 años, y junto a su familia, permanecio en Conroe, TX hasta su ultimo dia. Papi Chiquito fue un hombre muy alegre y lleno de vida. Le encataba la jardineria, andar en bicicleta, y caminar por la ciudad. Pero lo que mas le daba alegria, era jugar con sus nietos y pasar tiempo con su familia. Dejo su huella en los corazones de las personas que lo conocieron, y sera recordado por siempre. 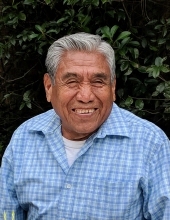 Maurilio Soto (Papi Chiquito) 78, passed away on January 19, 2019. Born on September 22, 1940 in small town located in Guerrero, Mexico. He was married to his wife Francisca Romero and had 4 children: Jose, Dalia, Veronica, and (preceded in death by) Rodolfo. He had a great family, which consisted of 1 daughter in-law and 2 son in-laws: Violeta, Jose Alberto, and Damian; and 8 grandchildren: Rodolfo, Iris, Monica, Mayo, Ivan, Josemir, Bianca, and Damian Jr. He came to the United States 38 years ago, and along with his family, established a life in Conroe, TX. Papi Chiquito was always full of live and very joyful man. He loved to garden, ride his bicycle, and have long walks through the city. But what he loved the most, was to play with his grandchildren and spend time with his family. He left a mark in the hearts of all who knew him, and he will always be remembered. To send flowers or a remembrance gift to the family of Maurilio "Papi Chiquito" Soto, please visit our Tribute Store. "Email Address" would like to share the life celebration of Maurilio "Papi Chiquito" Soto. Click on the "link" to go to share a favorite memory or leave a condolence message for the family.